Gone are the days when gyming was an unsociable grind. At Outrivals we want to know who you are, what your story is, and provide a place for you to invite your friends and be a part of a community. Our Personal Training programs are tailored to the individual, and the Small Group Training Classes offered in our gym are a versatile and affordable way to be exposed to a personal training experience. We know that sometimes the biggest obstacle is yourself! In order to help you take on your greatest rival, we shape fitness goals that are tailored to you. It’s time to outrival yourself! Want to know what training with us looks like? Check out our video, which shows you what our Small Group Training Classes are like. All memberships offer Open Gym access during open gym hours. Come and train whenever you like! All monthly memberships give access to over 50 Small Group Training Classes, with a maximum of 10 people per class. All Outrivals trainers have a specialist background in fitness. Strength and conditioning is just the start! + Free Smoothie Every Session. £7 no show/late cancellation (within 6 hours of class time) charges apply to Small Group Training Classes. Class Packs do not include Open Gym access | Open Gym Hours. All levels are welcome, and we mean it! You literally need no background in a gym environment to get started. All of our classes are infinitely scalable so you can jump right into any session without hesitation. Likewise, if you have some experience, the scalability works both ways so expect a work out! How does the monthly program work? With Personal Training, you will usually work within ‘Blocks’, specific to your goals, and progress over a period of time. We have taken this model to the way we design our Small Group Training classes, allowing you to see logical progress over 4 weeks (with each week having a different focus), starting with endurance, then build, into strength and finally challenge. At your Body MOT you can find out more about which classes suit you and your goals. We offer Small Group Training classes and Personal Training memberships that run month-to-month and can be settled by autopay on the same date each month (30th). To get this set up, just get in touch with us via phone or email and we will organize a pro-rate until the start of the next billing cycle so you can get training right away. Our packages are varied and flexible to adapt to your training frequency and the goals you have set for yourself with your trainer. At your consultation, your trainer will make a recommendation based on the above but ultimately it’s up to you! Not much! Our facilities provide everything you need, from showing supplies to equipment necessary for workouts to great training gear options from our branded merchandise. The changing rooms are supplied with hair and body care products and other essentials that will make sure you are leaving here looking as fresh as you feel. What else do I get with my membership? Work your way up to a free membership with our Outrivals Rewards Program by collection points everytime you come to a session or buy a smoothie! 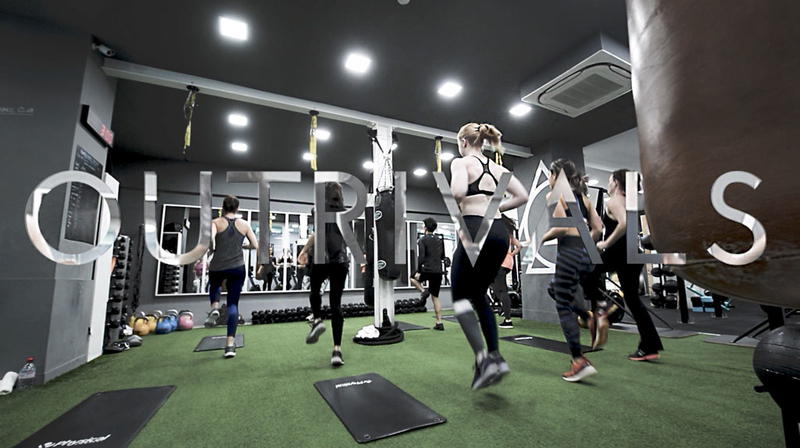 On top of that, all new members are gifted with a Body MOT where you can discuss with trainers what your fitness goals are and also get some pointers on how to move safely. Lastly, all monthly members receive gym access to train themselves during open gym hours.